WPArena covers all things related to WordPress: Themes, Plugins, Tutorials, Guides, Deals and Beginner tips. 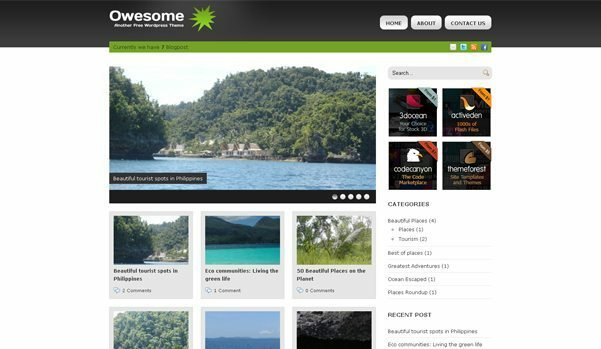 Owesome Theme is a wonderful WordPress Theme with Simple, Clean and unique modern interface. Owesome Theme comes with a custom gallery type. It has 125 x 125-pixel side banner advertisements. The Theme is created using 960gs PSD. It has also a jquery coda slider integrated into the featured homepage area. Owesome has a custom contact us page created using customize admin theme options. Sidebar Widget ready and compatible with all major browsers like Firefox, Safari, IE7, IE8, IE9, IE10 Chrome and Opera. A Contact Form, now we're getting somewhere. WPArena is a premium online resource site of WordPress and is focused on providing excellent WordPress Tutorials, Guides, Tips, and Collections. The site design is updated at regular intervals with more features. Look here. You can read more about WordPress Arena here. © 2019 · WordPress Arena · All Rights Reserved. We are not affiliated with Automattic or WordPress.